If you were tuned in to your TV last week as news broke about the first indictments in special counsel Robert Mueller’s investigation into possible ties between the Trump campaign and Russia, you likely had a very different experience depending on which news channel you were watching. Russia-related coverage was much more plentiful on MSNBC and CNN than it was on Fox News as Americans learned of the charges against President Trump’s former campaign manager Paul Manafort, Manafort’s former business partner Rick Gates, and Trump’s former campaign adviser George Papadopoulos. 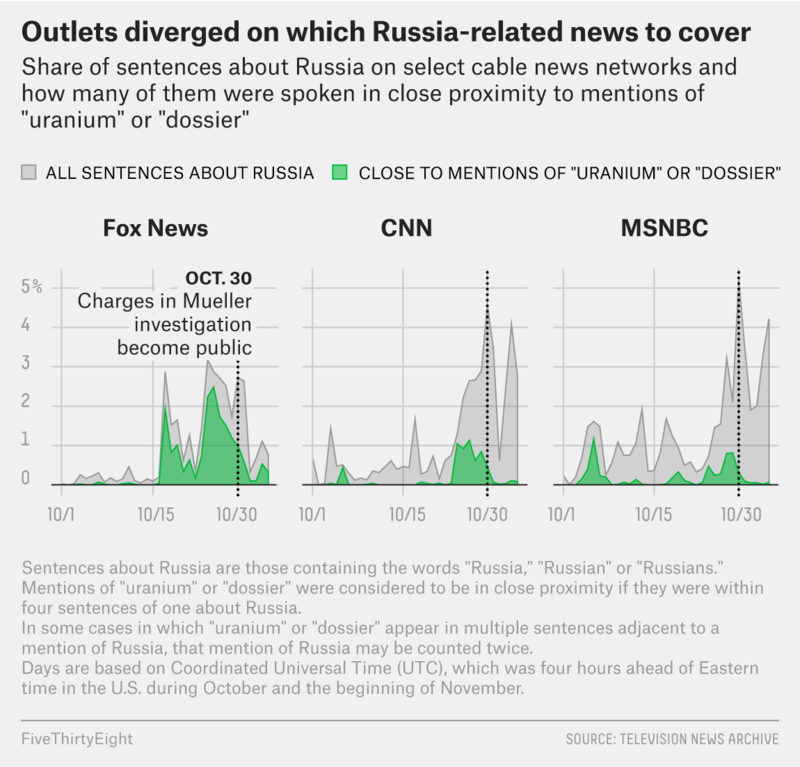 However, our analysis of the three major cable news outlets showed that the networks had all been airing Russia-related stories, some of which were about the investigation, in the days and weeks before the indictments became public. It’s just that the ideological leanings of the network tended to determine when each covered Russia-adjacent news and which stories it focused on. 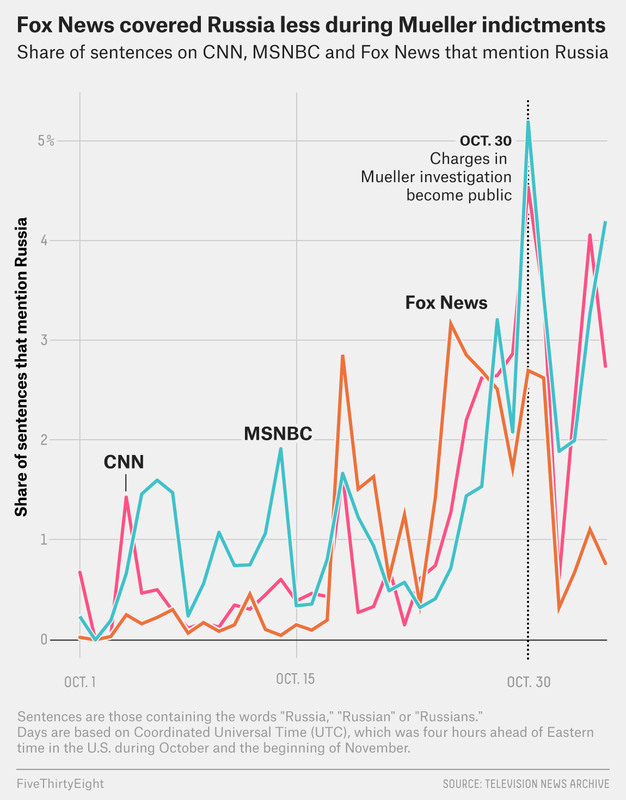 In the first two weeks of October, MSNBC, whose audience leans left, aired more coverage of stories related to Russia than either Fox, whose audience leans right, or CNN did. (CNN’s audience is between the two ideologically but also leans left.) Some of those stories were about Mueller’s investigation.3 Other Russia-related coverage that MSNBC broadcast in the first two weeks of October included revelations originally reported by the The New York Times that Russia was using Facebook to influence what Americans read online during the 2016 election cycle. But perhaps the most interesting spike in MSNBC’s Russia coverage occurred on Oct. 6, when MSNBC’s Russia-related coverage frequently mentioned a dossier of allegations of compromising information about Trump from Russian sources that a former British intelligence officer had compiled during the 2016 campaign.4 The coverage focused on the news that the author of the dossier may have been willing to speak to Senate investigators about the contents of the document. Although CNN was relatively quiet on Russia during those two weeks, we did see a spike in its coverage near the beginning of the month, when much of it mentioned Facebook. All three networks’ Russia-related coverage began to spike again when Attorney General Jeff Sessions testified in front of Congress on Oct. 18 about President Trump’s firing of former FBI Director James Comey and other topics. However, Fox News’s Russia-related coverage spiked the most — in addition to airing coverage of Sessions’ testimony to Congress, it alone among the networks was giving airtime to a re-emerging story about the sale of uranium to Russia while Hillary Clinton was former President Obama’s secretary of state. This story, which was first reported in 2015, returned to Fox after The Hill published an article on Oct. 17 containing new information about an FBI probe that had collected evidence about the corrupt practices of Russian nuclear industry officials involved in the matter. That night, Sean Hannity aired a Fox News segment on the uranium deal, and the story picked up steam from there. The dossier story also made a comeback during the second two weeks of October, but this time on Fox News rather than MSNBC. That followed a Washington Post report Oct. 24 that the company that had hired the former spy who authored the document was paid by a law firm representing the Clinton campaign and the Democratic National Committee. The list of words in this table was created by combining the 20 most commonly used words in Russia coverage from each network, with duplicates and common, filler words such as “going” and “think” removed. As the news broke and in the days that followed, Fox News’s coverage of Russia tapered off, while coverage on CNN and MSNBC continued. On Oct. 31, there was a notable drop in Russia-related coverage by all three networks after a deadly terrorist attack occurred in New York City. Our query starts Oct. 1 and ends Nov 4. All times reported by the TV News Archive are in Coordinated Universal Time (UTC), which is four hours ahead of Eastern time in the United States. For example, on Oct. 14, when coverage spiked on MSNBC, the network led several segments with a story that was originally reported by NBC News about Manafort’s connections to a Russian oligarch. The Television News Archive allows us to query its database for phrases that occur in close proximity to each other, defined as within four sentences. Interesting tidbit I found in my research: Among the major cable business news networks, Fox Business featured the dossier and uranium stories, while Bloomberg and CNBC hardly aired any coverage of them or Mueller’s investigation, right up until the indictments went public.